Hello everyone! Do you also smell this? Yes, it is the delicious smell of our goal that is now so close that you can almost taste it! Thanks to your amazing support, we’ve now passed the 90% line and are preparing to also get the last 6k€ on our final day! In this update we’ll tell you about a special event to make the run for the deadline more interesting! There’s also a reminder of the IndiesCrashE3 contest, another large Press and Youtube Roll and a shoutout to the Ludum Dare sideproject of one of our teammembers. There is this guild in CrossWorlds. It is old, huge and it’s member are notorious for arriving just in the nick of time – to save the day! You can now join the guild of Last Minute Heroes! 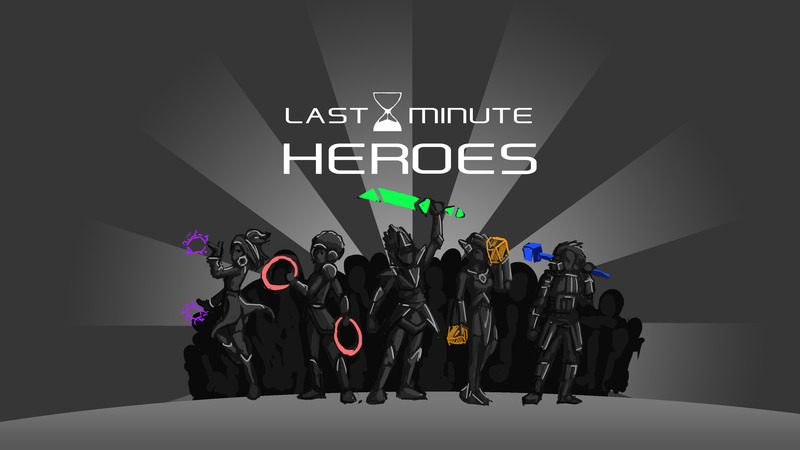 The Last Minute Heroes will be mentioned in several occasions along the adventures of Lea and you will even meet some of their members in person! And in one occasion at least you will find a list of all guild members – and your name will be among them! Simply donate exactly 13€ on Indiegogo without choosing any perk and you will automatically join the guild! Among all guild members we will then hold a raffle (most likely the weekend after the campaign) to select the characters that will have a special role in the game. And the best thing: the more 13€ contributions we get, the more special roles we have! Your guild member will appear in CrossCode and have a quest for Lea! Your guild member will appear in CrossCode and have a nice chat with Lea (you decide the text)! Your guild member had a high rank so they created a nice statue of you that you will find somewhere in CrossWorlds. Comes with a custom text, too. Example: If we got 75 contributions, there would be 1 quest NPC, 1 regular NPC and 3 statues! Finally: if you want to increase your chance for a special role, you can donate 13€ multiple times. However, you can only be at most one guild member and have one special role. Also: you can become a Last Minute Hero in addition to the perk that you have already selected! So what are you waiting for? Come and join the guild! 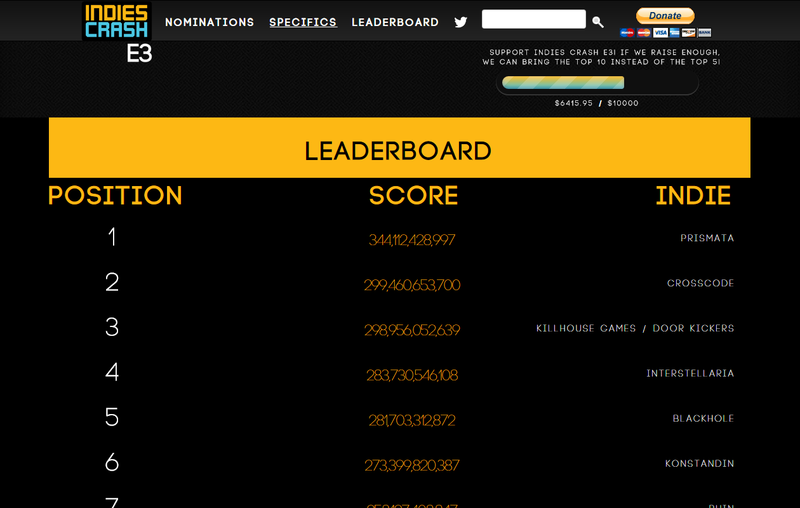 Also the IndiesCrashE3 contest with it’s addicting IndieClicker-minigame will be ending tomorrow on April 26th, 2015 at 11:59 PM PDT, in unison with our campaign! Currently CrossCode is still safely placed among the top 5 projects that get E3 passes and holding onto the 2nd place, though the distance to 3rd place is relatively slim, so we should keep on clicking for the honor of the 2nd place! Also burn your gems for trophies to get a final push! PixelDynamo published an article about CrossCode, which was even prominently featured on their main page! In it you can read about an interview with our main developers, Felix and Stefan, some of the new features and the all-important question of how to make internet-senpai notice you. The German site JPGames also did an article about CrossCode and the campaign, asking it’s readers to support us on the final steps towards the goal. Read it here (in German)! On YouTube, LotusPrince did a 3part LetsPlay of the current demo and managed to complete all 3 modes of it! What’s more, he also published them on ChannelAwesome where he is a contributor. Which is indeed awesome! Also on Youtube, The Indie Game Riot Podcast did a segment on CrossCode, gushing all over it and also discussing the merit of 2D sprite art for indie games. They also got a charming guest who talked about her equally charming game, fittingly called Charmixy: Witch Academy. It’s a cute and entirely free puzzle-game for mobile platforms that still needs support on Kickstarter (we can relate). Lastly, JinBob did an entertaining video about him playing the Story-Mode. He apparently liked it a lot, with all them balls, anime girls and f*ckin nerds. I’m assuming that most of you love the soundtrack of CrossCode, made by our musical onigiri Intero. Recently he has actually done the music for an entry in the latest “Ludum Dare” contest, called Springtime Warfare! 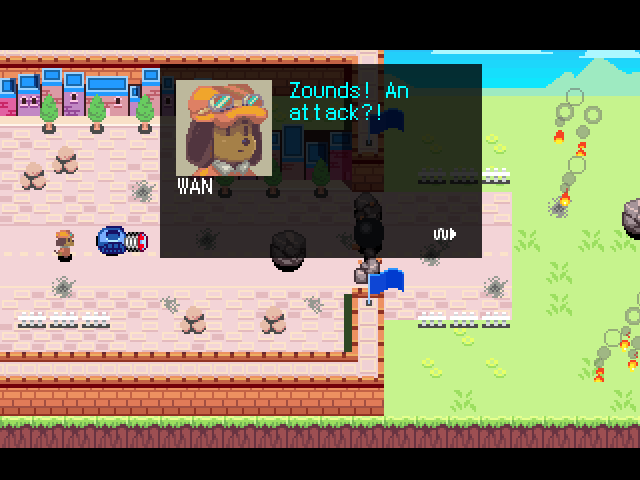 In this game you control the cute doggie Wan and his tank to fight against an invading force of evil cats. 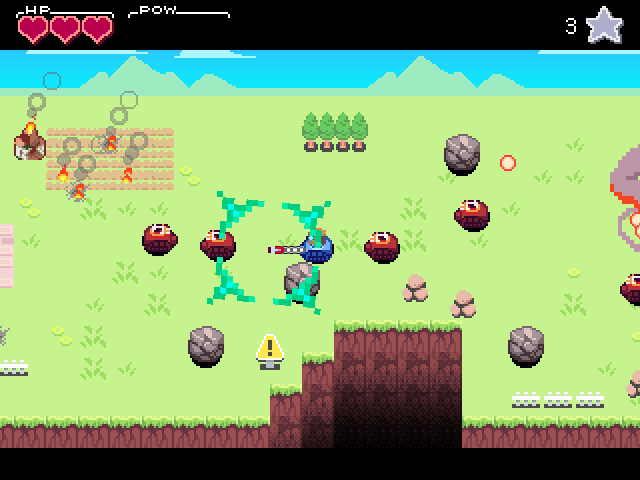 The twist: Instead of a conventional cannon, the tank is equipped with a large spring that can push around enemies or propel large rocks to defeat them. It is a short and simple game, but still a lot of fun and very impressive, especially for something that was done in under 72 hours. Maybe we’ll see more of it in the future? The current demo consists of one stage and a boss fight. And this is it again. We’ll talk again tomorrow, hopefully when CrossCode is already funded! What if I got the 5$ perk, and then gave 8 more euros, not logged in, but using the same email and paypal, will I still get in the Last Minute Heroes? Nope, sorry. A ticket for the raffle explicitly needs you to back 13€ that aren’t used for any other perk. Quite honestly, if you don’t have any other perk so far I’d suggest you just back another 10€ without a perk to upgrade to the 15€-perk to at least get the game when it’s done.